Shake siding installation: More time consuming, more expensive, may require more upkeep than vinyl siding. May warp. May not be as impervious to insect, water, and freeze-thaw damage as vinyl siding. 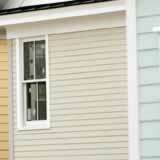 Shingle siding installation: Higher average expense per square foot. May require painting or staining. May warp. May not be as impervious to insect, water, and freeze-thaw damage as vinyl siding. Stucco siding installation: More prep work, labor is much more strenuous, more time consuming, and requires mores expertise to install than vinyl siding. Surface cracks can be a problem long-term. Requires periodic painting unless color is mixed into stucco, which increases cost. Brick siding installation: Brick or stone siding has the same considerations as stucco siding. Fiber cement siding or Hardiplank installation: More expensive, requires painting unless purchased prepainted.. Not as impervious to damage from water and freezing as vinyl siding. Double-hem mounting systems, varying panel thicknesses, and a variety of styles, shapes, colors and surface textures have made vinyl siding the choice for the majority of siding installations today. Be sure you research vinyl siding as an option for your do-it-yourself project before you choose.